A summertime cruise on the Inland Waterway is the perfect way to spend a summer day. This spectacular waterway covers 38.2 miles of lakes and rivers from just outside of Petoskey to Cheboygan. Along the way boaters will find state parks, great areas for fishing and swimming, wide-open waters for skiing, as well as ports of call for fuel and food. 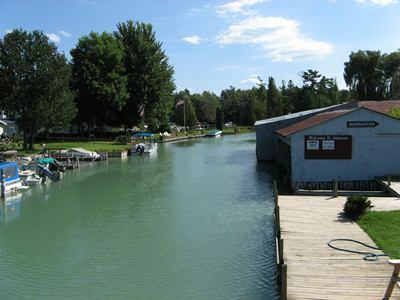 Many boaters begin their Inland Waterway tour on Pickerel Lake or Crooked Lake in Conway. Rental boats are available on Crooked Lake for a day's journey. From Crooked Lake, the waterway moves along the river through a set of locks and into Alanson. This is a great place for an ice cream cone or baked goods before heading down the river to Burt Lake. Burt Lake can be calm and inviting or wild and rough. On a hot summer day, leaving the calm no-wake waters of the Crooked River and then entering Burt Lake means it is time to accelerate to build up some wind for cooling off. Pass across the water to Indian River and anchor off of Burt Lake State Park. Sandy beaches, shallow areas perfect for swimming and plenty of picnic tables are available. The journey continues through the Indian River into Mullett Lake, the largest fresh water lake in the state. This long and wide body of water is the place to anchor for some fishing or swimming. Aloha State Park is located on Mullett Lake and this park has camping, picnicking, canoe rentals and more. Boaters leave Mullett Lake and enter the Cheboygan River for the last leg of the Inland Waterway's journey. Another set of locks bring boaters down to the level of nearby Lake Huron. The Cheboygan River meanders through Cheboygan where dining, lodging, shopping, and more are available. The nearly 40 mile journey ends as boaters enter Lake Huron in Cheboygan. With Mackinac Island just a short hop away, many visitors will want to visit this historic spot before heading back home. Pack the cooler, picnic basket and bring the sun tan lotion and fishing pole for a great day on the Inland Waterway!